Finally dropped under the £450 mark again! Includes free delivery. Experience a whole new smooth. NVIDIA G-SYNC eliminates screen tearing and minimizes stuttering for legendary PC gaming. Futuristic aluminium base design with matte finish and ZeroFrame bezels level-up your desk. Aggressive redesign and ergonomic tilt/height adjustment for the ultimate gaming setup. Conquer your enemies with Predator GameView. Shooting aim-points and customizable gaming profiles give you the upper hand. Minimize motion blur and zip through space with 144Hz native refresh rate. Now that's fast. HUA is the TN. I swear this was in the £300s on prime day. Also I bought this on Amazon at £430 on release, though price went up quite a bit after that for a while. I'm happy with the TN, the price of the IPS is laughably obscene. Correct the TN panel is the same price at Amazon now. The IPS was £439.99 2 days ago. Correct the TN panel is the same price at Amazon now.The IPS was £439.99 2 …Correct the TN panel is the same price at Amazon now.The IPS was £439.99 2 days ago. And I got one with IPS. This one frim OP was £300 then cold from me. Not a deal. Cold for me too. Picked up the 27" HP Omen, new on ebay for £330. 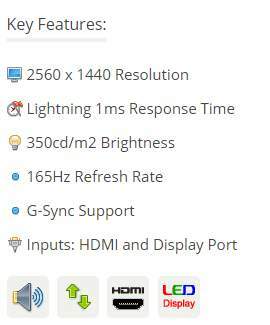 165hz G-Sync and also TN. I'd need to change the stand on that. 27", why would you in 2018?. As other's have said, the IPS version has been this price on prime day, and £10/£20 more in previous months. If you don't need a monitor right away I'd hold out for that. So what would YOU in 2018!? Just a warning that last time I tried updating windows 10 past build 1703 Gsync refused to work for me and even now when it works I still find it has too much input lag. Judging by nvidia’s passing the buck to ms and the latter preferring freesync it could be dying tech just like physx. I have at present 32'' acer xb321hk, and that looks small after using a large TV. Cant get used to the Bling look of it, the stand is an eyesore. Wouldn't buy another acer. I have at present 32'' acer xb321hk, and that looks small after using a …I have at present 32'' acer xb321hk, and that looks small after using a large TV. Cant get used to the Bling look of it, the stand is an eyesore. Wouldn't buy another acer. I have a 43" 4K for PS4,Switch and films wall mounted above 3 27" IPS monitors arm mounted and anything bigger than 27" would be daft. Its what the room is suitable for and requirement. What a strange thing to say lol. I hope Amazon will repeat the offer again. I dithered and missed it. Prime day deals may resurface as deals of the day, and guess there's always Black Friday. Not bad but I'm holding out for a decent price on a 1440p monitor with HDR whenever they are out! £441 for a monitor and getting voted hot when it has been over £100 cheaper previously? No. They aren't that bright though, I've got this monitor and I don't notice the red legs. If that's what stopping you getting the best 2k monitor... I would reconsider! I got the same monitor, but 24" for 300£, I wouldnt consider this a deal. 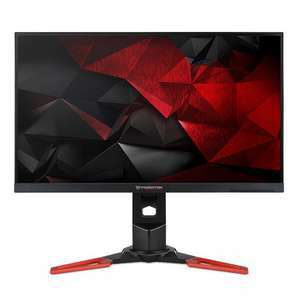 £429.99 now, the price for these monitors seems to be falling constantly recently. Possibly due to better specs coming out (ie HDR, 4k-high refresh rate etc) driving the demand down for these despite still being awesome? This very model was £329.99 on prime day. I understand that's been and went and I wish I had pulled the trigger then but wasn't sure on if I wanted an ultrawide or this, so ended up indecisive! I may hold back until these fall in the £300+ mark which I predict may happen in the remainder of this year, seeing as how I'm kicking myself for missing the prime day opportunity. Like I said I've noticed a significant drop in price since before the prime day deal and I can only assume it went that low for a reason, eventually the model will be discounted that low again, just a matter of time. Heat for the mean time, however if you can hold back I feel it will drop even lower, very soon.